Discussion with Dr. Tom Shippey on "Laughing Shall I Die"
Discussion on "Laughing Shall I Die"
Join Signum University on Thursday, May 24, at 2pm EDT for a roundtable discussion on Dr. Tom Shippey's forthcoming book, "Laughing Shall I Die: Lives and Deaths of the Great Vikings." 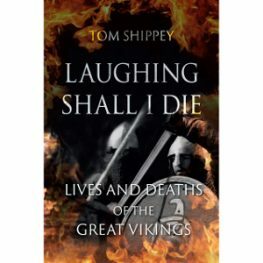 Join Signum University on Thursday, May 24, at 2pm EDT for a roundtable discussion on Dr. Tom Shippey’s forthcoming book, Laughing Shall I Die: Lives and Deaths of the Great Vikings. The discussion will include Dr. Shippey, Dr. Nelson Goering, Dr. Paul Peterson, and be hosted by Dr. Carl Anderson. Tom Shippey has taught at six universities, including St John’s College, Oxford, and Visiting Professorships at Harvard and U Texas. At Leeds he held the Chair of English Language and Medieval English Literature held in the 1920s by Tolkien. His publications include books on Old English and (three of them) on Tolkien, and in later years he has taken a strong interest in “medievalism,” that is to say the way in which the Middle Ages are represented in modern literature, with a particular interest in Jacob Grimm, Tolkien’s great predecessor in the field of comparative philology. At Signum Dr. Shippey has taught courses which combine these interests, including a general introduction to philology as seen by Tolkien, and one which looks at the Old English poem Beowulf, again as interpreted by Tolkien. Paul Peterson is a Germanic philologist with a PhD in Germanic Medieval Studies from the University of Minnesota. His research interests are primarily in Old Norse language and literature. Nelson Goering grew up in the Ocooch ‘Mountains’ in Wisconsin, and earned his BA at Grinnell College, Iowa. He has a DPhil in Comparative Philology and General Linguistics from the University of Oxford. His research interests centre on Germanic comparative grammar and alliterative verse. Carl Edlund Anderson has taught for Signum University since 2017, particularly in the Introduction to Old Norse and Norse Myths & Sagas courses. He earned a BA in Folklore & Mythology from Harvard College and a PhD from the Department of Anglo-Saxon, Norse, & Celtic at the University of Cambridge. Join Signum University on Thursday, May 24, at 2pm EDT.